The camouflage is coming off very soon. Just last month, McLaren teased a new model under the temporary name 'Grand Tourer.' We weren't given many details about the car, other than it will exist outside of the current Sports Series, Super Series, and Ultimate Series ranges and it will be designed for comfort and space. The name is still a mystery but McLaren has confirmed it will not be called 'GTZ,' a name that was recently patented by the UK automaker. McLaren says the camouflage will come off completely on April 30, 2019, as this new Grand Tourer will become the fourth model to be revealed under the company's Track25 business plan. But before then, McLaren has decided to give us a better look at the car with three new images. From these new photos, we can see McLaren hasn't ditched its mid-engined layout in the pursuit of luxury. McLaren will test the new car by driving 1,000 miles from its development base near Barcelona, Spain, back to the McLaren Technology Center in Woking, England. In order to make sure the test is realistic, it will be completed with two occupants and a full complement of luggage. 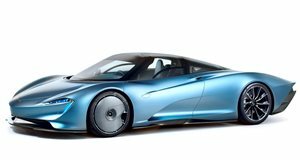 We still don't know if the Grand Tourer will have a three-seat layout like the McLaren Speedtail, though it certainly looks like a third seat could fit based on the photos. The car was reportedly shown off to a few people, including The Smoking Tire's Matt Farah who said on Twitter, "Just saw the new McLaren GT car. No photos, but it is very pretty, looks like nothing they currently make, (outside, at least), has a lot of power, and will hold a full set of golf clubs plus more luggage in the rear boot. Or, incredibly, two pairs of 185cm skis and their boots." Although we don't know how much power the Grand Tourer will produce, we do know output will come from a twin-turbo V8 as it does in other McLaren models.